When managing a local portion of a large, corporate hotel program, it’s important to think about how your actions support your company’s larger travel strategy and meet local needs. These tips will help you accomplish both. Identify independent hotels in top markets, and load them into your corporate tools. Your company likely has chain wide agreements with large brands, but they may not meet local travel needs, especially in secondary cities. In fact, 75% of European travelers report the top reason they make non-compliant bookings is a lack of accommodation options near their worksite. * Utilize other content sources from your travel management company, like their own specially sourced rates or third-party hotel content (i.e. Booking.com or Expedia Partners Solutions), to add more property types to your hotel program. Rely on TMC or other discounted rates for lower volume hotels. If you cannot guarantee at least 150 room nights in major cities or 100 room nights in smaller cities, TMC discounts can be more effective in reducing costs. Our RoomIt Rates provide up to 20% off best available rate acting as a great long tail to your hotel program. When you do have the volume to negotiate fixed or dynamic rates, you may also have the ability to reduce the time spent on RFPs by securing multi-year contracts with your historical hotels. Expect a more manual sourcing process. You may want to check with your TMC’s hotel content offering before jumping into negotiations with a hotel, because RFPs with some independent and boutique hotels often involve picking up the phone to explain rates and other aspects of your negotiations. Once rates are secured, you can work with the property to publish them to your booking tools using our CRS by CWT or channel manager tool. Design a strategy to deal with the growing loyalty trend. Consider offering Loyalty Booster, a campaign-based incentive program that provides travelers with additional loyalty rewards for booking preferred suppliers within preferred channels. When booking, European travelers are generally more influenced by breakfast inclusion than any other hotel attribute – more than property type, health club / gym inclusions, and even the hotel’s photos – so don’t skimp on breakfast in your hotel negotiations. Travelers aren’t always wrong to do so. Non-refundable rates can actually be beneficial to your program. Click here to read how. yet rate re-shopping tools can produce 1-2% total program savings. Since these tools typically rebook similar rates at the same property, they can provide a seamless experience for both you and your travelers. Ask your TMC about their recommended rate re-shopping tools. Use food and beverage spend in your hotel negotiations. More companies are including food and beverage spend in their hotel negotiations. Since F&B represents a large portion of travel expenditure, it can be effective in justifying discounts. F&B spend can also be used to negotiate discounts at hotel restaurants too. Implement a dedicated mobile booking tool that instills booking confidence in travelers. Two-thirds of the Middle Eastern workforce is under the age of 35, and mobile usage is high among this group. Booking confidence is boosted when as many rooms and rates are consolidated into one platform or tool as possible, so travelers can be sure they are finding the best possible option. For example, our myCWT mobile tool provides over 800K properties and consolidates rates from many major sources, thus removing the traveler’s need to shop around. 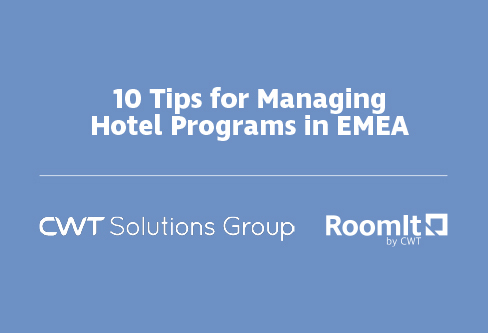 Click here to learn more about managing travel in EMEA.